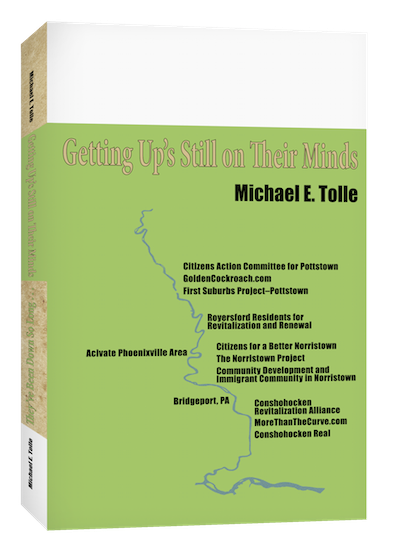 I’m taking a break from posts about the future of Norristown, Pa. to pick up on my other current blog series that examines its upriver neighbor, Phoenixville. I have been asking the question “Why Phoenixville?” for some time now. Why is Phoenixville the only town on the lower Schuylkill River that is experiencing a locally generated revival? (remember, I differentiate it from what is happening downriver in the Conshohockens). The question was a major focus of my recent East Coast trip, culminating in my talk to a gratifyingly large audience at the Phoenixville Public Library. Thus it came to pass that a speaker about the recent history of Phoenixville came armed with more questions than answers. 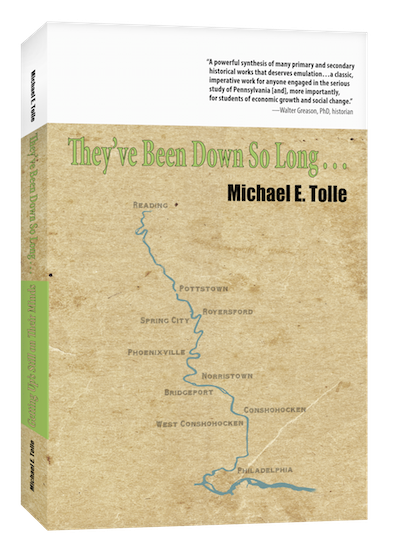 I outlined the Borough’s history of emulating the other river towns, not just in its structure but also in the reason it came into existence, and the arc of its history, both in the good and then the bad times. But then I focused on the period since about 1980. I had good, well-researched explanations for pretty much all the basics of Phoenixville history up to that time, but not after. No one else does, either, I admitted, and asked for their help. At the end of my talk, several in the audience offered spontaneous thoughts. I also asked them to email me their thoughts on the subject, and have since received several excellent responses. They vary greatly in length, from short lists to extensive essays. I continue to study them, but one theme dominates by its presence, in both the spoken comments that followed my talk and the written ones that have since been submitted. A few mentioned it specifically, others referenced events that demonstrate it. Regardless of how it was phrased, Phoenixville’s spirit of “Community” stood head and shoulders above any other subject. It was described in different ways, using different terms, but they all were basically describing the same thing. We are on to something here, for sure. I reprint below a substantial excerpt from one email, because it asks my “Why Phoenixville?” question—in its own way—but only after offering, by example, the fundamental answer. 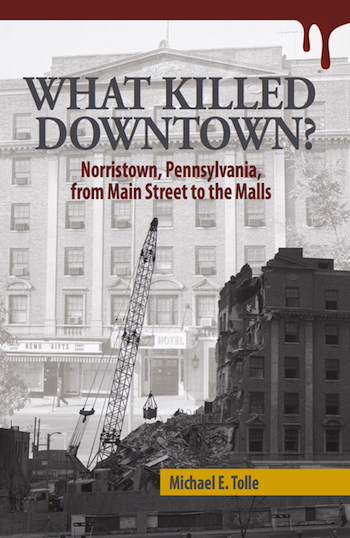 “December 6, 2014 will live as a day of infamy in the hearts and minds of residents of Phoenixville Pennsylvania. Sitting down in front of my computer, that Saturday, I could barely believe my eyes when I read “Vandals Torch Firebird”. It had been exactly one week since my wife and I moved into our new home in the area once called “Ironsides”, just west of the borough line. We had moved from West Chester, a town thought to be on the up and up. Prior to that we have lived in some of the less fortunate river towns of Reading and Pottstown. The Schuylkill flows through my veins. We had attended Firebird festivals a few years earlier and looked forward to this one, our first as newly minted residents. Seeing as the bird had been torched, this seemed a wash now that it was a fait accompli. The details were sketchy, but what was certain was at 3:30 AM fire was reported out at Friendship Field. By the time the crews arrived the bird was a goner. A call had been made to the community for help, I felt the need to be a part of it. Although it was a cold rainy day with many boxes yet unpacked, as a retired carpenter, I knew I could give them a hand, even if I didn’t know anybody out there at all, a strong force was nudging me towards the door. Arriving at the scene of the crime I found an amazing sight. Crowds of people lugging pallets, old lumber and anything else flammable in nature across the muddy fields, deeply rutted by the firetrucks that had managed to only save one wingtip. Hendrik [The Firebird Festival’s single-named founder, leader and visionary] had put the call out to the community for anything that could be had to give a long-shot chance at rebuilding a bird. At the curbside, a line of pickup trucks emptied piles of donations from many of the community’s businesses along with tons from local attics and garages. Finally Hendrik announced “We have enough!” With the light rain cooling the ash pile of the old bird, we got down to the business of giving life to a new one. Although not the bird that once had been, our collective effort produced a worthy stand-in and just a few hours later, to the roar of the crowd, it then also succumbed to immense flames. If you have any thoughts, I’d like to hear them. Please email me. I have been publishing this blog every two weeks, on Fridays. Now, I need to create space to undertake my next writing effort, as it will be a very different subject from those on which I have so far focused. Thus, beginning after this post, I will publish a new “The More Things Change…” post on a monthly basis. It will appear on the first Friday of each month. This post, coming as it does two weeks after my previous one, is the last according to the old schedule. As it appears on the first Friday of June, it is also the first post under the new schedule. My next post will be on Friday, July 1st. I hope to compensate with longer, more thoughtful, essays. I thank you, in advance, for your patience and for your continued support.